For many the LCWA home PR team, January means one thing – IBS. No, I’m not talking about digestive disorders (although trade show food can definitely be rough on the stomach). I’m talking about the International Builders’ Show – the largest building and construction industry gathering in the world. 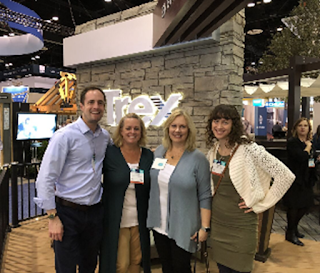 As one of the nation’s top agencies specializing in home products, we’ve attended the show and handled media logistics for many years on behalf of several different clients. What makes this year unique, however, is that we had not one – not two – but three clients exhibiting at this year’s show, all eager to connect with builders, showcase new products and secure media coverage for the months ahead. Trex Company – We continued to up the ante for our client Trex Company, once again securing a record number of trade and consumer media appointments. Editors were eager to hear about the latest trends in decking and railing – and in particular, the trend toward more modern, contemporary outdoor spaces. Case in point – the new Trex Signature Rod Rail, which offers the popular look of cable railing, but with the durability and strength of aluminum. Rod Rail has already been a hit with media, with an immediate placement in the ProSales and BUILDER magazines’ show recap. BRK Electronics/First Alert – In just its second year at the show, safety client BRK/First Alert secured one of its biggest honors, the Best of IBS Award, for the Onelink Safe and Sound Smoke/CO alarm. Leveraging this news, the LCWA team doubled the number of media appointments from the previous year. Already, the alarm has been featured in Hardware Retailing, as well as a live broadcast of the “On the House” radio program, recorded on the show floor. DAP – DAP, a leading manufacturer and supplier of caulks, sealants, foam, adhesives, and repair products, marked its return to this year’s show with an exclusive breakfast for media attendees. As editors and reporters fueled up for the day, LCWA provided tours of the DAP booth and introduced media to the latest innovations, including Dynaflex Ultra Advanced Exterior Sealant. The breakfast approach allowed LCWA to spend quality time with media, who didn’t feel rushed to move on to their next appointment. The effort has already paid off, with an immediate placement in BUILDER and Multifamily Executive magazines’ show recap. Beyond immediate placements, the International Builders’ Show is an ideal opportunity to reconnect face-to-face with editors and lay the groundwork for coverage in the year ahead. If the early results are any indication, we’re in for a promising 2018!